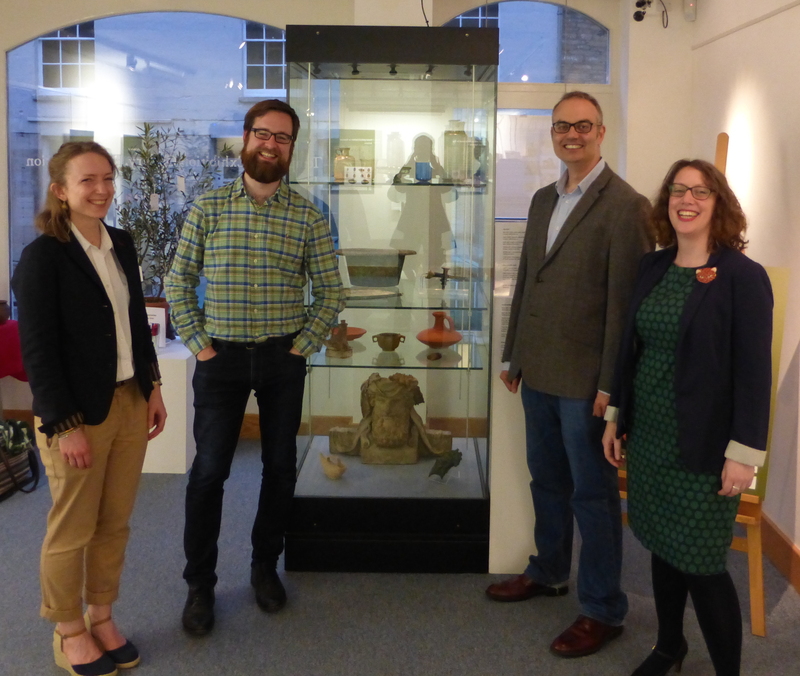 These three poems were written in response to the Food for Thought exhibition, generously funded by the Roman Society and supported by the Corinium Museum. 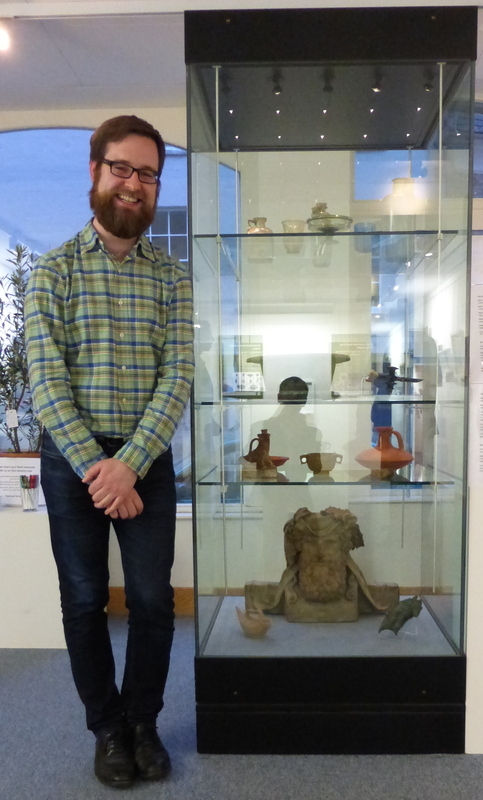 I’ve been writing poems based on British Roman history and artefacts as part of my work at the Roman Museum in Canterbury (https://canterburyromanresident.wordpress.com), so was delighted to be asked to do the same at the Corinium. There are lots of approaches to creating this kind of work, but I am personally interested in the small and everyday objects – they really do link us to our past, and tell us something of the people we come from. 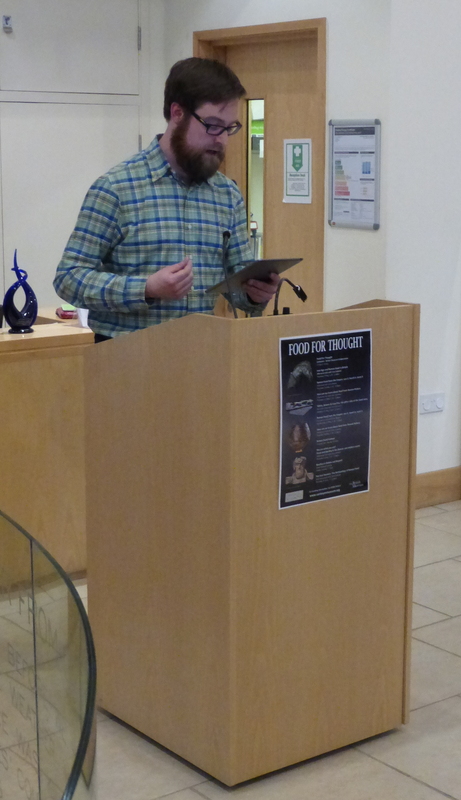 Dan reciting his poems at the launch of the ‘Food for Thought’ exhibition. Dan with the ‘Food for Thought’ team at the exhibition event. I was struck by the sense of movement the potter had captured in the dog depicted on the hunting cup. I looked into how dogs had co-existed with humans for millennia, being one of the fundamental species that helped our survival. I got to thinking about Keats’ ‘Ode on a Grecian Urn’, and how he sees the love scene depicted on that object as immortalised. I wanted to do the same for the dog – and indeed, some of the lines in poem are directly adapted from the Keats’. 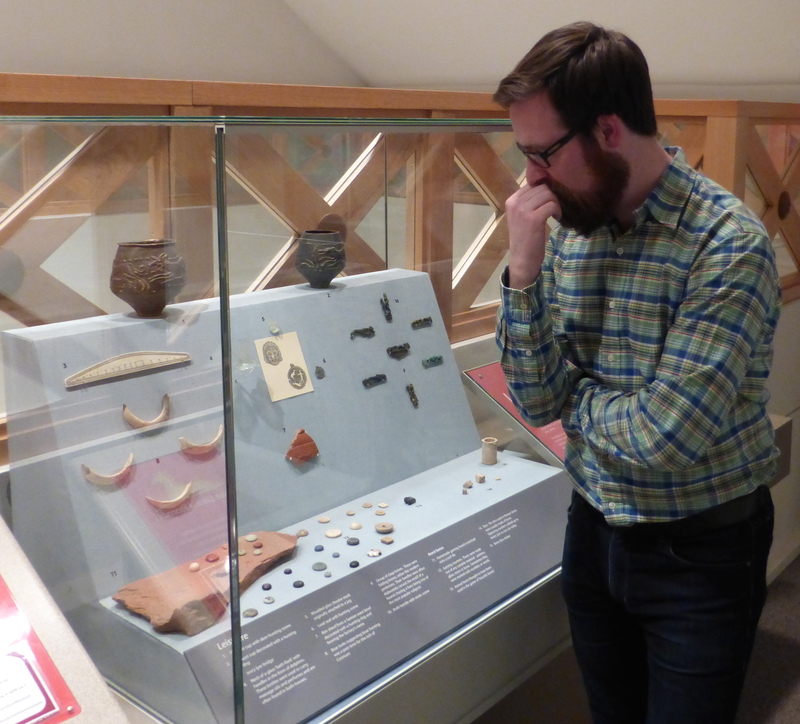 Dan musing about the Hunt Cups. carries you eagerly over eternal ground. your stomach growling more than your throat. fearful of other dogs not so well treated. let slip to fight in the politics of conquest. as timeless as the earth you are made from. The child’s drinking vessel is an interesting object as it’s adorned with vines and grapes – signs of Bacchus, the god of wine and revelry. This wouldn’t be something obvious to put on a child’s object! I wanted to imagine why this might have happened, and who would get their child such an object. I settled on a new father, who was perhaps regretting his overindulgence and wanted to make peace with the gods through a prayer. 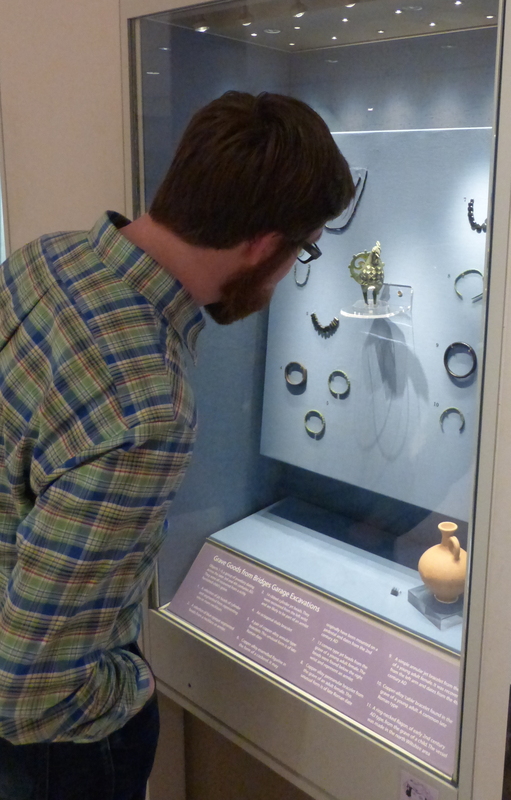 Dan with the objects from the British Museum. You can see the baby feeder in the bottom left-hand corner of the case. that of bitterness and fury. the raging bull of my anger ready to charge. a fleeting beauty, not a permanent scar. but of harmony with Bacchus. I knew I had to write a poem on the Corinium Cockerel – the artefact is truly beautiful, and its backstory is tragic and intriguing. It’s the kind of object you want to reach out to and hold with your hands, and I can imagine that being especially true for a child. As it was buried in a child’s grave, it must have been loved by them – and the child in turn loved by the family. To see the cockerel and hear Dan’s poem, click here. Dan absorbed by the cockerel. to her softly-breathing sleep at night. breathed life into you through her love. turning our villa inside out, trying to find you when lost. hope rising as surely – and slowly – as the sun. holding you, cockerel, as I hold you now. To find out more about Dan and his poetry, click here. To hear Dan recite these poems, click here. This entry was posted in Corinium Exhibition and tagged baby feeder, Bacchus, British Museum, cockerel, Dan Simpson, Hunt Cup, Keats, poem, poetry, tettine on July 3, 2015 by zkamash2013.